-Information is provided in a media-rich, immersive manner designed to give visitors an experience of the information rather than just words and images. B) To enable service users and visitors to express themselves creatively in novel ways. – People with disabilities can find it difficult to express themselves using conventional tools and instruments. Tam is designing a number of multi-sensory, digital tools and instruments which enable people with all kinds of ability to play, interact and express themselves creatively. 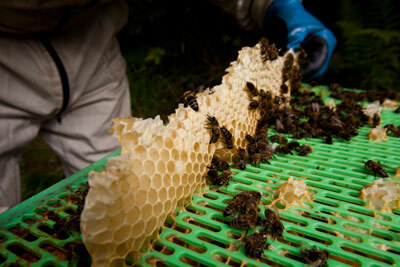 At Pitscurry they keep bees for their honey – yes but also for their environmental benefit. Visitors are able to experience the sound of the bees as if they were right there – swarming around their head. This was achieved by recording the bees using a clever combination of microphones and deploying the sound through an impressive surround sound system (8 speaker array). Projected images of the bees light up the room making the experience yet more vivid immersive and informative. The ‘AirPlayer’ is exactly that. Users are able to play music by moving any part of their body through the air in front of the ‘AirPlayer’ sensor. Some of the service users have difficulty moving their hands making it difficult to play many conventional instruments. The AirPlayer enables them to enjoy music making using any part of their body that they wish to use.